The first step in manufacturing baking soda, is creating soda ash. This is achieved by using Trona Ore (which must be mined first). The Trona Ore is first mined and once that is completed it is then refined to form sodium sesquicarbonate which contains both soda ash and baking soda. Then the sodium sesquicarbonate is placed in a centrifuge, this separates the crystals from the liquid. The crystal are then dissolved in a bicarbonate solution this creates a saturated solution which then gets carbonated in a carbon tower. The solution then reacts with the carbon dioxide which forms sodium bicarbonate crystals. The crystals then move through another centrifuge were the filtrate is removed. The crystals are then washed in bicarbonate solution The result is a cake-like substance which is ready to be dried. The washed cake-like substance is now dried in a vertical flash dryer. After this is done what you have left over is more then 99% pure Baking Soda. 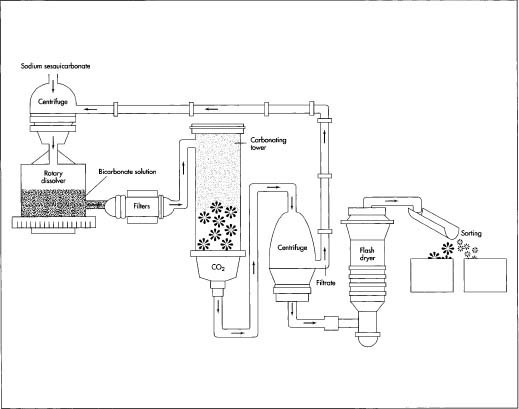 Above: a diagram of the manufacturing process.